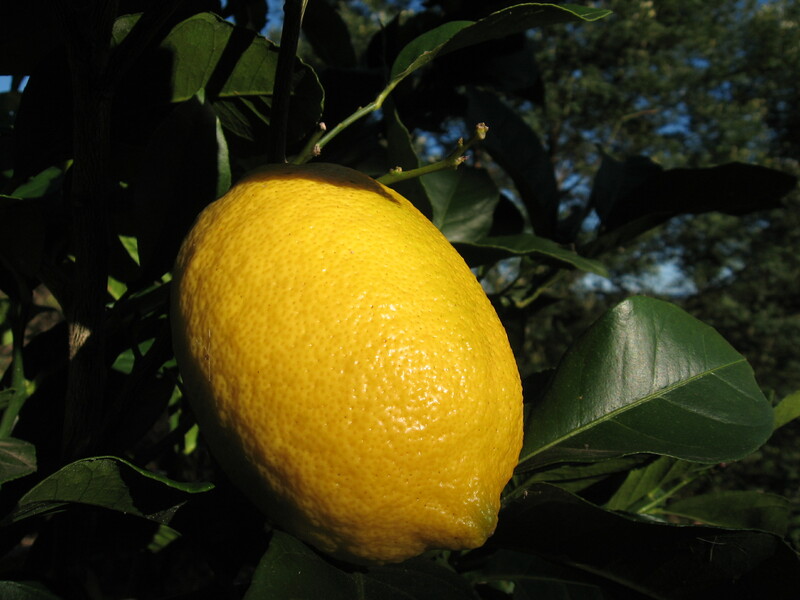 The Eureka it is a large vigorous lemon and is likely to outgrow it pot. You would find that the dwarf meyer is perfect for pots and better suited to Melbournes climate. 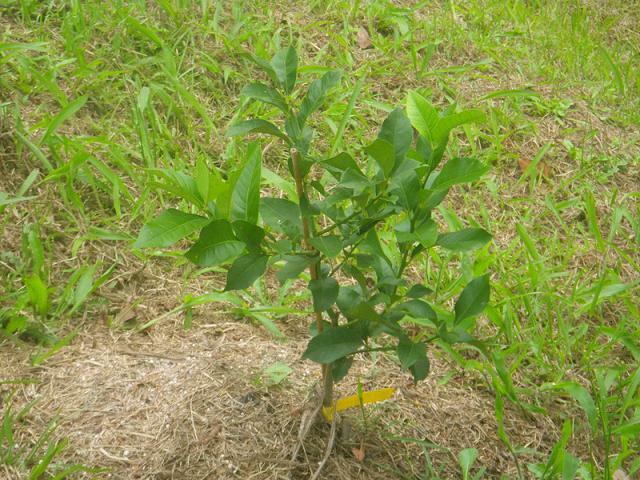 It will grow 3-5 meters when planted in the ground in good conditions. It can however be kept to under 2m by pruning or you can slow it's growth and keep it smaller by growing it in a pot. 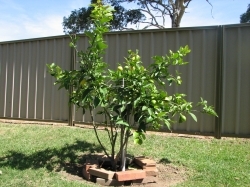 The smaller the pot the smaller the Lemon Tree. 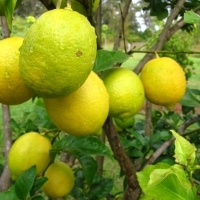 Hi Lydie, At this stage we are not sending citrus to SA due to quarantine, we are working on becoming accredited at this stage so this may change in the future, please check again with us in 2015. We currently have the dw Granny, here is the link #DwarfApple814 but we will not have ballerinas until winter 2015 #AppleFlamenco2502 To find out how much freight will cost to your address please drop the items you are interested in into the checkout and enter your postcode, or visit http://www.daleysfruit.com.au/Freight-Special.php and enter your postcode.. 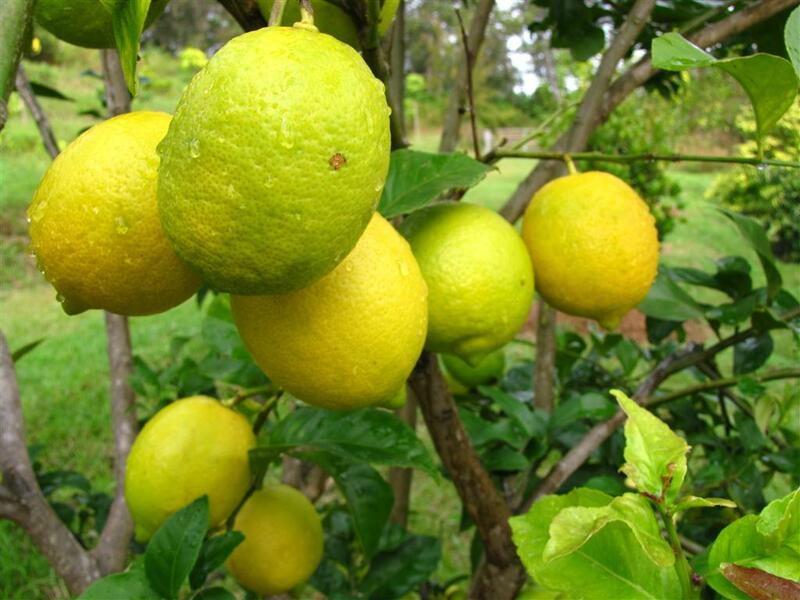 Comments: - This lemon is very hardy, and finally producing some decent fruit. Grows well in a large tub. Placing a wormfarm underneath the lemon has resulted in an abundance of Lemons. Has produced lots of good sized seedless thin skinned juicy fruit for past two years. Purchased from Daleys. September 2009: More growth and more fruit recorded. Applied sulphate of potash and watered in. October 2009: More growth recorded. November 2009: Seemed to have stopped growing as I have not plucked fruit from tree. 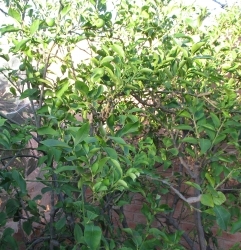 December 2009 to March 2010: Lots more growth and never ending supply of lemons. The tree is becoming a bush, branching out from close to ground level. Weekly visual inspection for pests and fungal infections. First year in...needs flowers removed. Easy to grow. Powering along Aug 2010: flowering, fruiting - doing what it does. 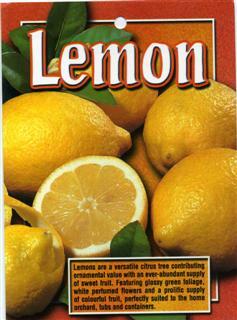 It has a more intense lemon flavour than the Meyer and better for that lemon "tang" in cooking. Eco oil for leaf miner on occasion. 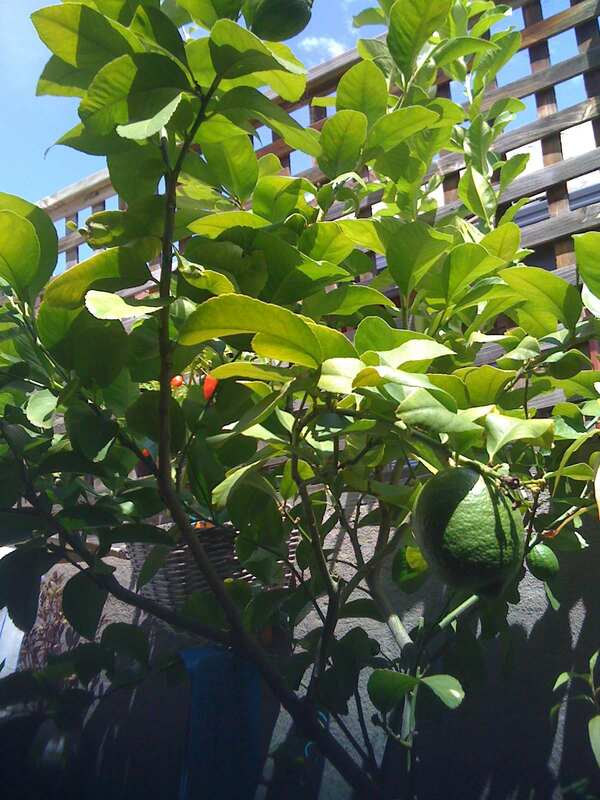 Grew this lemon tree from a seedling over 10 years ago. Fruits at least twice a year with heavy crops. Only white oil when we really need to. 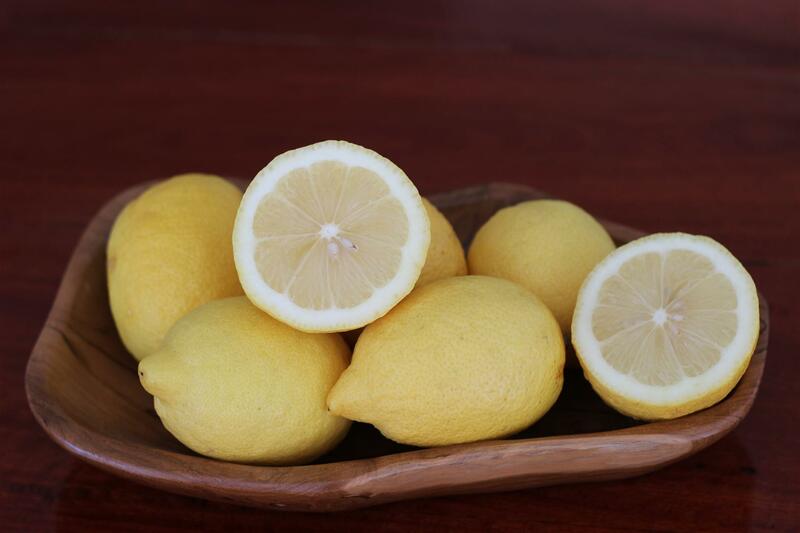 i love the lemons - great for salads and cooking and looks good too. if you count curly leaf oil then that is the only persticide used. i am trying to get rid of yellow leaves and also curly leaf. i have put oil on it. should i cut off the old branches with curly leaf. can i trim it back hard to make it look good again? it was retained while we rebuilt our house and alot of concrete slurry went into the soil. i have just fertilised and put the curly leaf oil on and it looks better. i have sugar cane mulch around the base. 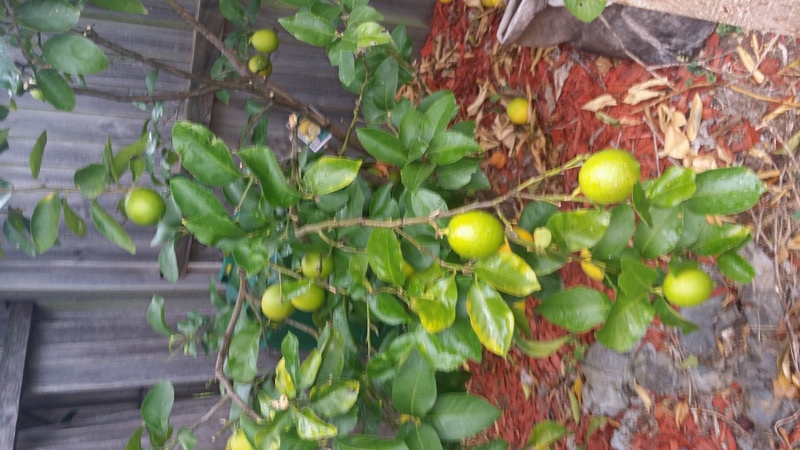 Probably got about 40 lemons last season, new growth and flowers coming through now. Similar output to last year, has grown slightly. Much more receptive to pests than my lime. Pest Control: pull off and dispose of infected leaves. don't over water to prevent root rot. Comments: - We have fruit from it. Good juice. We have shade cloth guards around all our trees due to the wind. 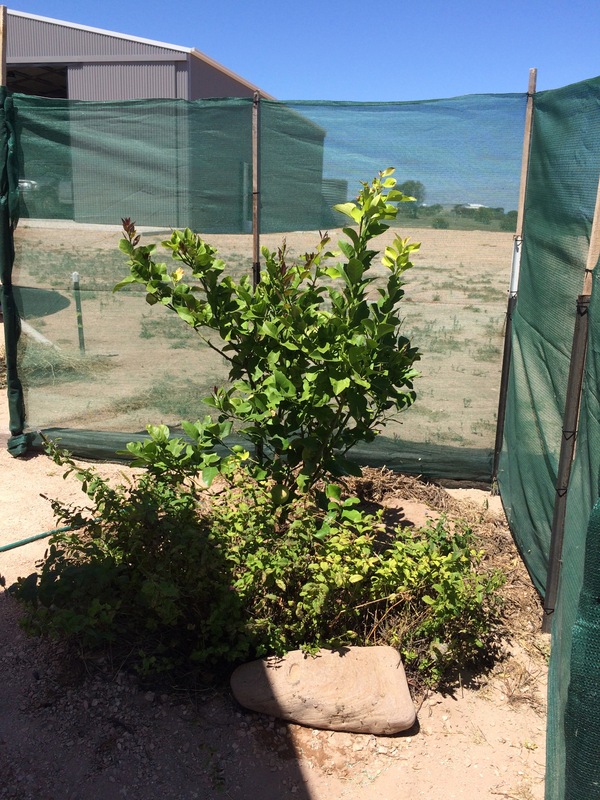 This little lemon grows to the height of the shade guard and then stops. Poor thing - every time it pokes a little branch up into the wind it gets ripped to shreds. When we visit we raise the guard up further and further just to let this tree get up. It took forever to grow - then all of a sudden it took off - may have had something to do with my hose starting to leak. 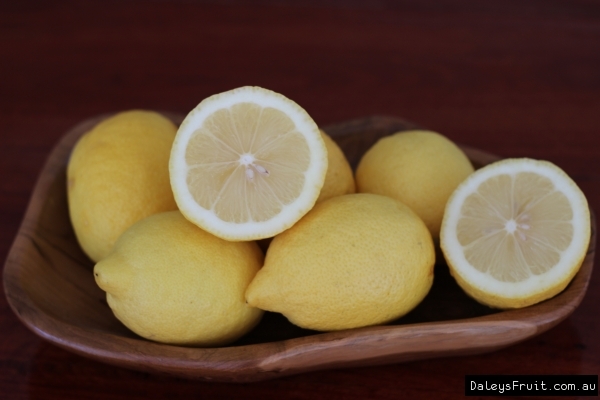 Fruit is massive & lovely taste - makes the best lemon cordial. 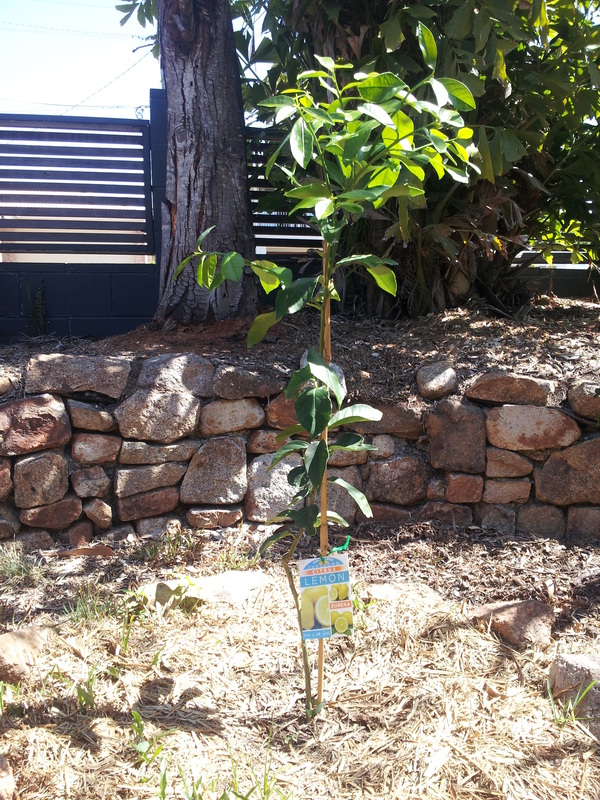 Sometimes bit by fruit fly - use econaturalure, wild may & now cera trap around orchard.Nice shady place for chooks. Now has 5 fuit 2 are more advanced than the 3 newer ones and apart from some leaf curl it is doing well. 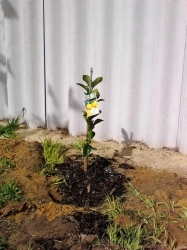 The same as my orange tree- this took quite a while to get established but really took off once the vegetable garden was extended and it effectively "moved" from being in the lawn to being in the vege garden. Not suprising really- citrus have very shallow root systems and the grass competes with them a lot. 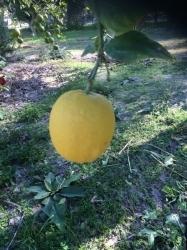 Has had reasonable crops all year and its rare that I don't have lemons hanging on the tree. 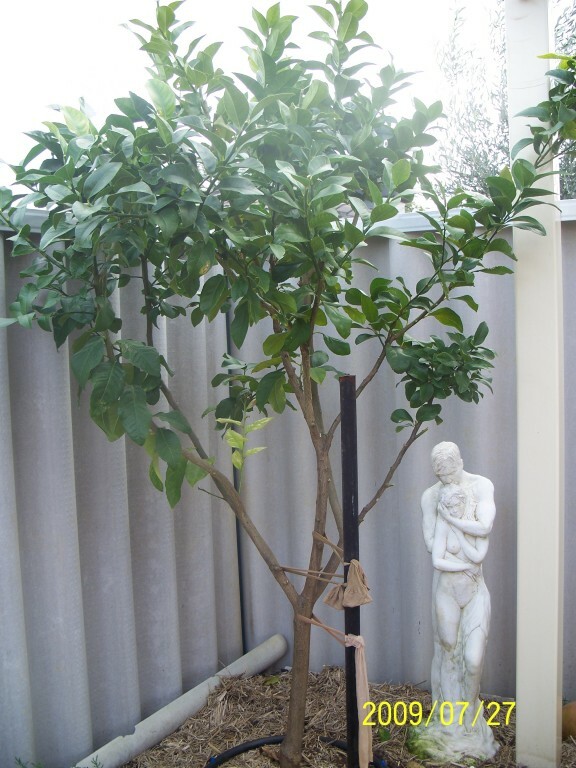 Pruning on this tree is mainly to avoid having it take over too much of the vege garden. Fantastic tree, constantly producing fruit. The fruit does have a very thick skin, but inside the juice content is high. Foliar feed regularly with seaweed and fish emulsion. 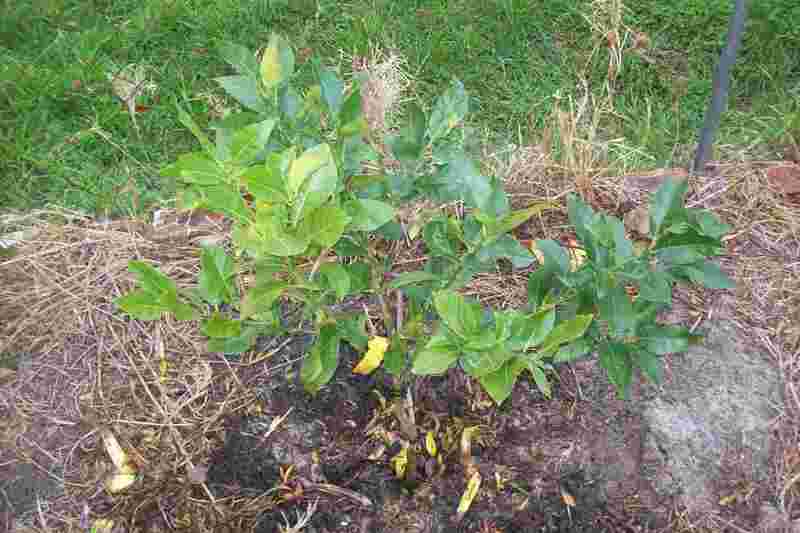 I got my Eurika tree as people told me it would not grow in cold climates. Guess what? It grew beautifully. 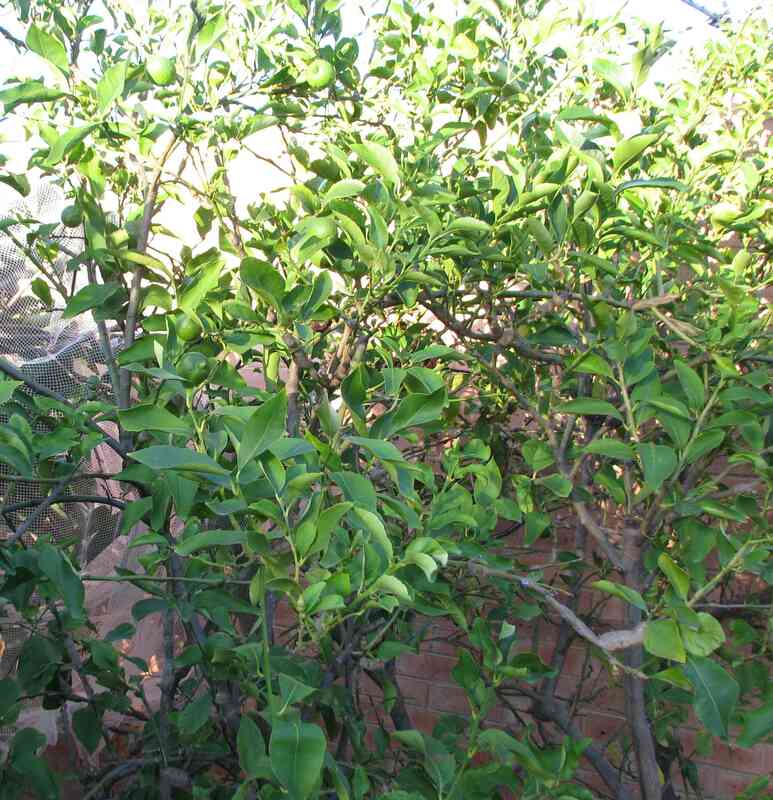 It is now my biggest citrus tree and I prune it severely. I love the fruit. They remind me of the lemons in Europe. Winter oil in winter, pest oil in summer, Confidor when attacked by Orange bugs (and my husband does not have time to kill them). Recently purchased grafted. way to big for the small poly bag its in, will be getting transplanted into 8 gallon pots in a couple days. Lemons are actually very rare here, most people only know about limes here, which they call "Limones" thinking that Limes and Lemons are the same thing. in spanish they should use "Lima" for limes, and "Limones" for Lemons, but since they are not familiar with good ol yellow Lemons, I intend to show em by growin em :) . the plants are healthy and had a lemon or two already on them ( being grafted and all no surprise ) but these plants really need a bigger container and soon. Just recently obtained plants, I will be monotoring, if I do require pesticides Ill go for natural Neem oil. 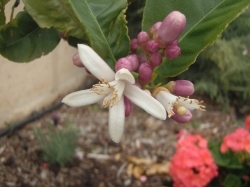 Slow to start with only a few fruit, Is flowering like mad now in spring. Should be a good crop for a 1.5m tree. How can I have more fruit on it? 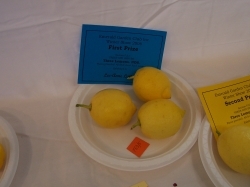 Comments: - Had an Eureka Lemon many years ago and it was a great profilic tree. 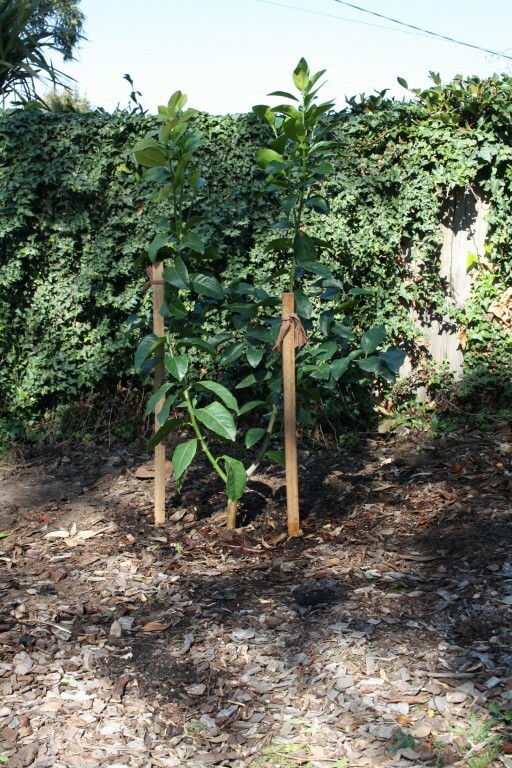 All our fruit trees will be grown in large containers/pots as we have some very large estabilished trees, gums and none of fruit trees were growing well. So we transplanted them into large pots. Not sure if it was citing or seed , Daley product . Hardy lemon tree , tall ,ants love it and so do the aphids , lot of work keeping it clean . Pest Control: eco oil and banding. Comments: - I love warm lemon juice first thing in the morning for health reasons. Comments: - Grafted onto Sour orange. Massive fruit. 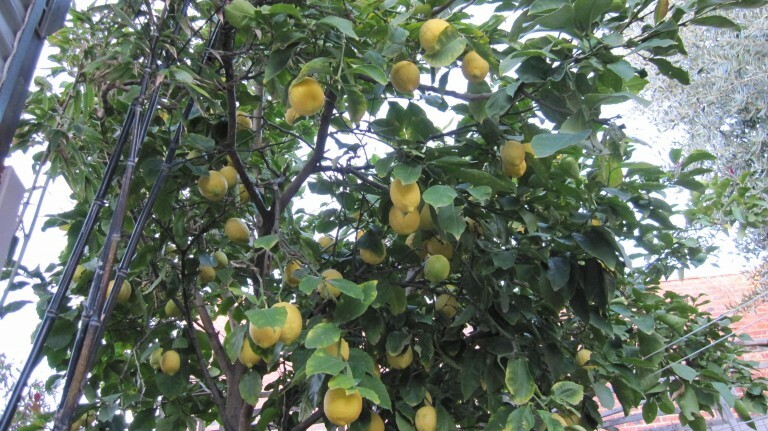 This is a really productive tree that produces massive amounts of excellent quality fruits. I have more than enough fruits to share with friends and neighbours. Older than me. fruits remorselly. I have grafted a Tahitian lime onto this plant new graft groth now about 20cm plus 1 flower. 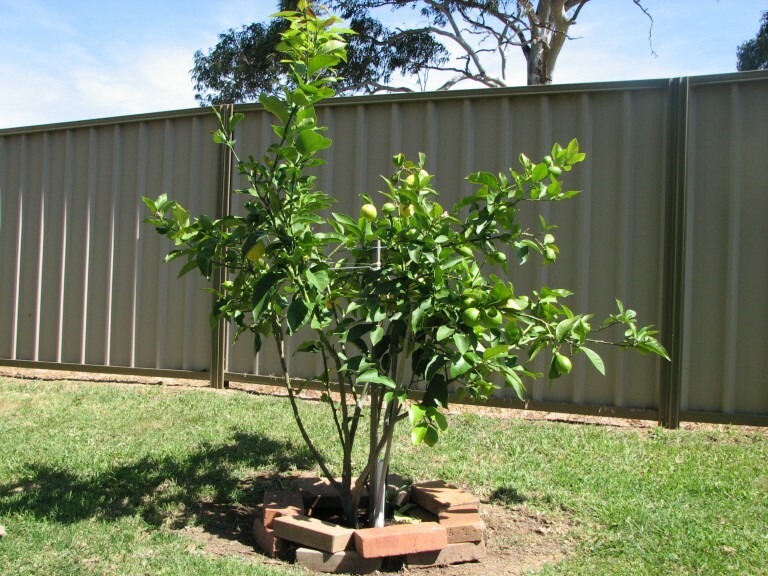 trimmed to be relatively compact - lovely lemons and lots of them! Espaliered into a fan on 2m high trellis. 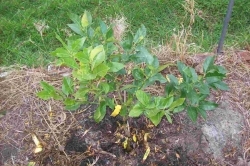 Planted March 2009. Significant new growth. Don Burkes said that every garden needs a lemon (or was it manderine?). I heard this was similar to the 'Lotsa Lemon' and that is a productive little bush. It looks very healthy and has lots of blossums right now. 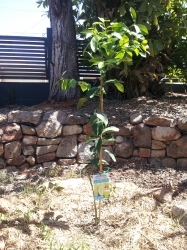 Comments: - I have high hopes for this tree, Shannon and i planted it in the front yard so passers by can pick the fruit. This tree is from Daleys and is on sour orange rootstock, which hopefully will increase its ability to handle the salinity in grey water and the salt wind. Time will tell! got to about 2 mtrs then died suddenly. most likely lack of care. Comments: - I just love lemons. 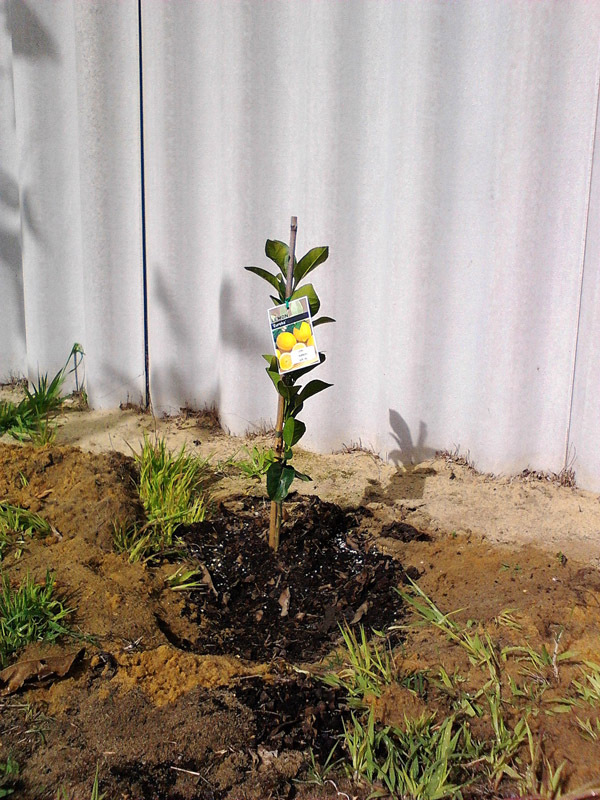 Everyone should have a lemon tree!!! Comments: - This tree was purchased from a hardware store closing down sale for a bargain price. It has held on through suspected neglect at the hardware store, confirmed neglect on my roasting west-facing courtyard, several moves, and spending the last six months in a dark and forgotten corner of the yard. Have finally found a permanent place for it in the garden and it is now getting full sun, retic and lots of seasol. 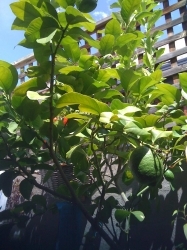 It is holding its fruit for the first time and I hope to finally harvest a lemon this sumer! Comments: - Good sour flavour, long cropping season- or so I hear. Has had good growth in it's second spring, but no flowers even though the orange, mandarine, lime and even tangelo have. Pest Control: None needed yet. Pest Control: I vacuum up the stinkbugs, works like a charm, they hardly come back. Comments: - Purchased Oct 2014 and in the ground. Dec 2016. 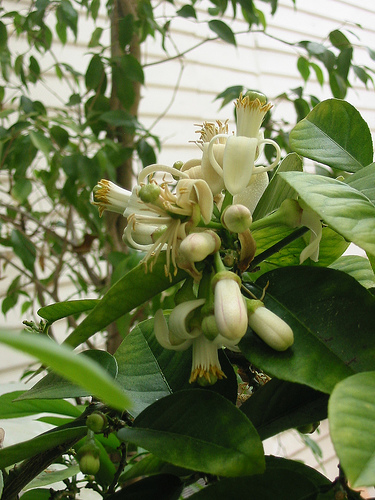 Well, this little tree has certainly shown up the Meyer lemon this year. 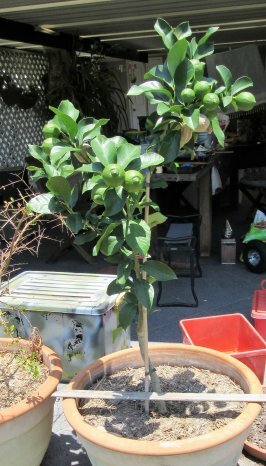 Its first year in a pot, and it has several nice lemons coming on. It did do this job of the Myer with it having its best season yet. Flowered shortly after planting, removed the flowers to let it grow - since then haven't had any more flowers, but a constant battle with leaf curl - obviously all the removal of the new growth is affecting flowering. Gets the same disease that the Lime tree gets. 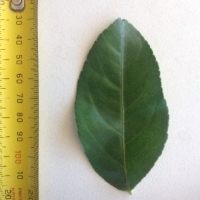 Leaves curl and parts turn brown. What is the best cure? 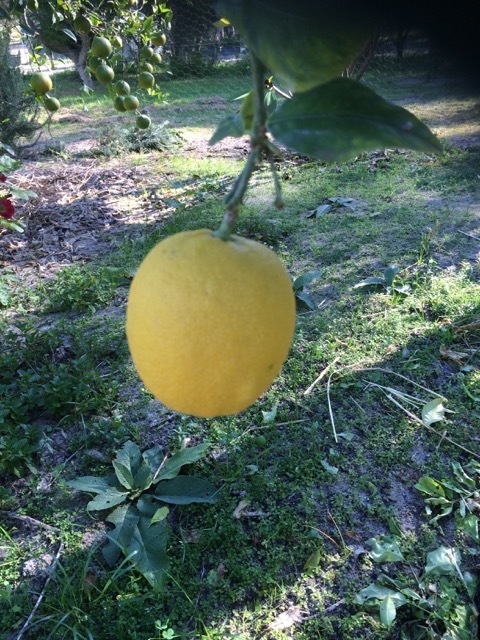 Everyone needs a true lemon in their garden! This little guy should be vigorous, and hopefully thorn free. 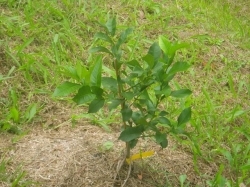 I'm trying to grow it as part of a citrus hedge. It hasn't enjoyed the transplant despite the good soil. The Eureka had to get moved in Jan 2012. It was growing faster than I ever anticipated and needed tip pruning every weekend. 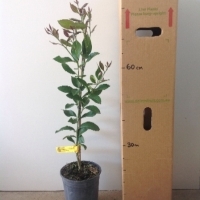 It has grown over 50cm in less than 6 months despite regular pruning. It has been relocated to where it can grow up taller away from the house. Its width will have to be managed as it is against a fence, but it can still spread and grow up. May 2012 - my attempts to turn this into a hedge failed. It is growing rapidly and seems very content in its current location at the edge of the vegetable garden! Was here when we moved in and is happy doing it's thing. None. Gets a bit of scale and aphids but nothing serious.